Forging(Hada): Forging Hada is supreme fine and uniform Ko-Itame in general and observe a bluish stains so called "Sumihada" at the upper middle in front. The most superior made steel gives off minute sprinkled sand impression to cover with thick Nie sparkling hard metal granules "Ji-nie" on Hira-ji surface and darkish precise lines of Nie so called "CHIKEI" activity that wells out from steel. The surface creates an atmosphere of lively sparkling impression so called Konuka-hada 小糠肌. Tang(Nakago): Nakago is UBU original, bottom heel shape is V-shape "Kengyo". One original peg hole of Mekugiana. Slightly slanting right filemarks. Back ridge of Nakago is flat. The signature in front is eight character that starts from an official district Ōmi-daijo 近江大掾 title, name of clan Fujiwara 藤原 and the smith name TADAHIRO 忠廣. 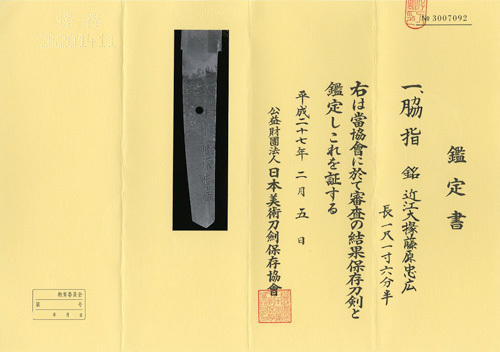 The subject artisan TADAHIRO 2nd generation established and developed the superior high standard quality of sword making for the major Hizen TADAYOSHI school and had laid the foundations for the later generations until 9th by the end of Edo period. The subject wakizashi remains solidly massive blade with an elongated medium Kissaki. Most superior forging method using top quality fine steel so called "Tamahagane" generates precisely fine Ko-Itame with most supreme sparkling Ji-nie glitter that generates superior Chikei darkish Nie lines activity. The forging scene as the saying looks like a cutting section of Japanese pear "Nashiji-hada". Gold plated single layer Habaki collar, Preserved in a Shira-Saya plain wood mounting. Recent polish/Condition scale: excellent - very good (using a scale of mint-excellent-very good-good-fair-poor).